There’s something special about Komodo. Could it be the Komodo dragon, the mysterious, ancient lizard, and the largest of its species on Earth? Or is it the island’s residents—descendants of former convicts who were once exiled from their homelands, banished to live in isolation? Perhaps it is the pink beach, where the sandy shores look as if they made of Himalayan salt. It’s not the question of what brings you to Komodo, but rather which of its enchanting sites will make you stay. Your private charter to Komodo will bring you to Indonesia, where the island is just one of many—17,508 islands to be exact. Komodo is between the two larger islands of Sumbawa to the west and Flores to the east. Nearby is a scattering of small spots of islands, coaxing those on Komodo to come visit on boats, sailing through the warm waters. Dutch sailors once told a tale of a dragon-like animal wildly roaming the island, its terrifying twenty-three foot scaly body breathing fire at anyone daring to cross its path. Upon hearing these shocking tales, Lieutenant Steyn van Hensbroek gathered his soldiers and stormed the island, only to find lizards that were 7-feet, and very much incapable of breathing fire, much to their relief. The Dutch government recognized the importance of the endangered Komodo dragon and swiftly issued regulation for its protection in 1915. You’ll find the Komodo dragon happily thriving in Komodo National Park (actually, the island itself is home to more than 4,000 of these adorably strange beasts). The park spans over three larger islands: Komodo, Padar, and Rinca, as well as twenty-six smaller ones. Founded in 1980 as an effort to protect this giant lizard, the park now strives to protect other species, on both land and sea. 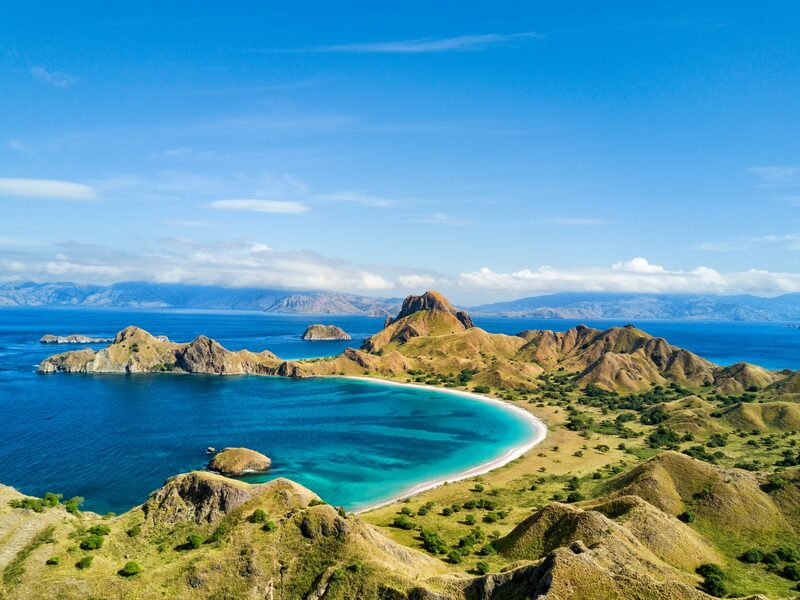 Komodo National Park is hot, dry, and rocky, but that doesn’t mean its landscape is lacking. Dramatic terrain covers the park where savannah vegetation makes for an excellent habitat for Komodo lizards. Nearing the coast are mangrove and cloud forests, hidden coves and bays, and patches of coral reefs dot the lazy waters. It is in these waters you will find over 1,000 species of fish, smooth manta rays, friendly whales whose songs travel beneath the shimmering surface, and everyone’s favorite marine animal, the sea turtle. Get up close to Komodo island’s diverse sea life during a daytime scuba-dive off of prime locations like Batu Bolong, on the north coast. Here, there’s a steep sea wall penetrating the ocean some 245-feet downward into a seabed. Kayaking, swimming, snorkeling, and hiking will fill your days as you navigate Komodo and its baby islands strewn in its surrounding waters. The atmosphere on Komodo is heavy with great respect for its native creatures, from its scaly, four-legged kind to the ones that take to the sky, and its animals that are one with its unmistakably blue waters. For a striking sight, there’s Pulau Kalong, where bats flood the skies in a flurry of wings. Watch the creatures charge against the sunset, its colors aflame with orange flares, reds bleeding into pinks, all against the darkening sky. The tiny island can be found in Komodo Island’s bay off of its center, where its mainland encircles it, like an extended arm moving to gather Pulau Kalong nearer. Across from Pulau Kalong is Komodo’s iconic pink beach. Pale pink sand butts up against glittering blue waters, gifting visitors with a truly unspoiled bit of tropical paradise. Marine life here is diverse, as the reefs are home to hundreds of exotic fish. A nearby hill proves to be the best view of this stretch of beach, where once again Komodo rewards those willing to take the climb with its staggering shot of its nature. At Pulau Kelor, a hiking trail beckons, bringing its travelers to the crest of a small hill over looking the shockingly blue waters, but you’ll have to work for it first. The trail is challenging, offering no help as you foot across the stark-white sands, but the view is worth the hearty exertion. The island is small and serene, a hidden gem in Komodo where access to it remains limited, but that’s the beauty of it. Loh Liang unfolds for explorers eager to see its reptilian residents up close. Non-scaly wildlife like Komodo’s grazing deer can also be spotted, along with hundreds of bird species that flood this portion of the national park. Bring your binoculars and camera with a good zoom to capture some of Komodo’s curious creatures. Investigate the trinkets and souvenirs sold by eager locals and hike trails of varying difficulty, walking the land amongst the reigning Komodo dragons, wild boars, and exotic birds. On Gililawa Darat, you can stand on its shores and see the thin strip of land that reaches from Komodo’s mainland and nearly connects the small island, like a painter who lifted his brush at the last second. Lawa Darat Gili is arguably one of Komodo’s best spots on its many island offshoots. Its rolling hills are blanketed in a rich green, and its rocky shores are the final step into pools of turquoise water. Watch the sunset on this island, as cumulous clouds add amazing depth to the colors that ignite the sky. On boat, sail to Taka Makassar, a mini droplet of an island that has secluded itself a ways away from Komodo. Sand bars peak through ice-blue waters and white sands frame the island, welcoming you to this small piece of perfect paradise. Snorkel alongside massive sea turtles, swim in its warm waters, and enjoy a day basking on a sailboat or on the island’s pristine shores. Komodo remains one of the untouched slices of the tropic, a best-kept secret where actual fantasy becomes a mystifying reality, as this is the place where dragons live peacefully. Roam Komodo with adoration for its nature, its wildlife, and its Indonesian culture in your heart. And remember, everything on Komodo is always worth the climb.